A fearless guide to awakening your mind using simple visual language. What do Einstein, Edison, Richard Feynman, Henry Ford, and JFK have in common? Like virtually all heavy-hitting thinkers, they looked beyond just words and numbers to get intellectual and creative insights. They actively applied a deceptively simple tool to think both smarter and faster: the doodle. And so can the rest of us-zero artistic talent required. 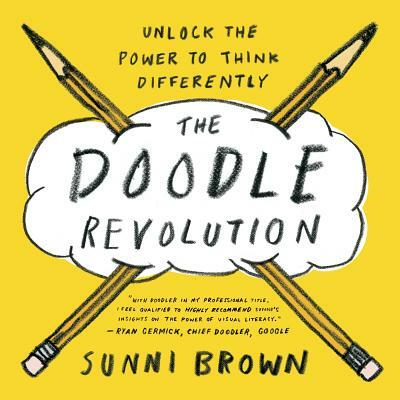 Visual thinking expert Sunni Brown has created The Doodle Revolution as a kick-starter guide for igniting and applying simple visual language to any challenge. The instinctive and universal act of doodling need only be unleashed in order to innovate, solve problems, and elevate cognitive performance instantly. Sunni Brown was named one of the 100 Most Creative People in Business and one of the 10 Most Creative People on Twitter by Fast Company. She is a consultant, an international speaker, the coauthor of Gamestorming, and the leader of a global campaign for visual literacy. Her TED Talk on doodling has drawn more than a million views on TED.com. She lives in Austin, Texas, with her husband, Mr. Pepper Pants, and her dog, Mr. Simon. "Why do we insist on representing our world using 26 letters rather than an infinity of pictures? Sunni Brown shows us how to doodle our way to better thinking. Her book will have you drawing insights on the page, not just in the margins." "Contrary to popular opinion, doodling is a serious endeavor. As Brown shows in this smart and accessible book, applying visual language allows you to see new dimensions of a problem -- and at times, new aspects of yourself. So get out your writing sticks and prepare to doodle!" "Doodles come straight from the Unconscious. That's partly why they work. Sunni did a beautiful job of shining a light on visual language." "Brown's defense of the doodle is convincing . . . this creative, fun book will definitely help you get your doodle on."